There’s nothing more frustrating than investing in a beautiful landscape and then watching it slowly dwindle to nothing. Because your lawn is filled with living organisms, it requires proper care and maintenance in order to keep it thriving. 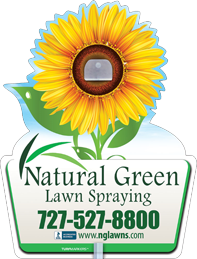 At Natural Green, we use natural and organic lawn care products, along with expert knowledge and practices, to keep your lawn healthy and beautiful. We offer lawn treatment services that naturally transform your lawn into a healthy ecosystem armed to fight off threats like diseases and pests. We offer three specific programs that ensure the health of your lawn: our lawn, shrub, and palm treatment services are designed to give each lawn customized attention and care. Our various services include fertilizing and weed, pest, and disease control. With Natural Green’s lawn, shrub, and palm services, you’ll have peace of mind while you continue to enjoy a safe and beautiful lawn. Our service programs consist of 6-12 applications that are spread throughout the year. Each component of our programs is aimed to effectively prevent threats while maintaining and enhancing the overall health of your entire lawn. Whether it’s walking barefoot in the grass or enjoying an outdoor picnic on a beautiful day, lawns should be enjoyed. At Natural Green, we make sure that each customer can do more than just look at their beautiful lawns. By treating lawns with natural and organic products, our customers are able to safely enjoy their natural surroundings. Many companies offer a cocktail of synthetic chemicals that render fast yet harmful results. Many of those products have been proven to trigger headaches and other sicknesses. At Natural Green, we have fine-tuned natural and organic lawn remedies that have been used for centuries and combine them with modern science. Our aim at Natural Green is to create an environment that is safe and beautiful. Fertilizers serve as the primary source of nourishment for your lawn. Just like quality organic foods promote a healthy body, natural and organic fertilizers promote a healthy lawn. After working with top scientist and botanists, we’ve developed a line of natural fertilizers that are designed to help your lawn thrive. Since most of the soil found around the Bay Area consists heavily of beach sand, we also use specific fertilizing methods that optimize nutrient intake. Weeds are a big threat to lawns. If left unattended, weeds have the ability to sap the life out of your beautiful landscape. At Natural Green, we are aware that there are currently no effective natural remedies for abating weeds. Because we are concerned with maintaining and preserving natural and organic landscapes, we carefully treat weeds with products that we have researched and found to be effective. Our constant maintenance programs allow our specialists to attack weeds before they become a threat to your lawn. The Florida climate serves as the perfect breeding ground for a number of nasty pests. From cinch bugs to mole crickets, your lawn can quickly become infested with pests looking for a good home. After researching a number of natural and organic ingredients, we have come up with products that target pests while not harming you. Our natural products also serve as a deterrent to a variety of pesky pests like mosquitos and ants. Lawn diseases can be aggressive and detrimental to the overall health of your lawn. Our method of disease control starts at ensuring that your lawn is healthy enough to fight off threats like harmful fungi or infections. By nourishing your lawn with natural and organic nutrients, it develops a strong and lasting immunity. Creating healthy lawns is our passion at Natural Green. Givs us a call or send us a message in order to have one of our knowledgeable lawn care specialists visit your home or business for a free lawn evaluation. There is never any obligation to purchase. Let us show you why we are a step above the rest.